#ApplaudHer Women Who Code (WWC) is nation-wide non-profit organization that promotes opportunities for incumbent and rising women engineers. On January 20th, 2016, NYSE invited our beloved Alaina and Zasmine to ring the NYSE Opening Bell, celebrating a new chapter, a new year of women who code movement. Women Who Code has helped many Silicon Valley women, and now women from all over the world including Hong Kong and Brazil, learn to code or rise above in their existing engineering positions. WWC hosts meetups in major cities, talks from senior and experiences coders & role models, gives out #ApplaudHer social media shoutouts to celebrate women's achievements in tech, and gives out discounted and free developer conference and learning opportunity tickets to young and aspiring women including Google I/O conferences! You can support Women Who Code by making a donation online, requesting a corporate donation from your company, volunteering at talks and events. You can become a member by joining a local meetup or subscribing to their online newsletter. "The New York Stock Exchange welcomes officials and guests of Women Who Code. 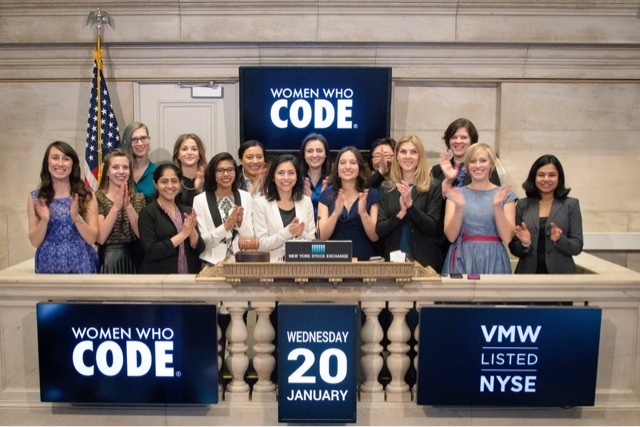 CEO and Board Chair, Alaina Percival, and Zassmin Montes de Oca, Chief Maker and Board Vice-Chair of Women Who Code, will ring the NYSE Opening Bell®. Post Women Who Code Rings New York Stock Exchange (NYSE) Opening Bell, a new chapter for women learning to code women who tech and women engineers. Follow our blog for more learn to code news. Learn to code movement. Despite being state of the art and fully equipped, most places for corporate events Chicago are available at exceptionally competitive rates. You can also get a bespoke pricing package based on the arrangements you need to make.